Take an international outbound flight to San Francisco. On arrival in San Francisco make way to a downtown hotel to relax after your flight or begin to explore the city, perhaps taking a stroll in Golden Gate Park or exploring the brightly decorated streets of Chinatown. 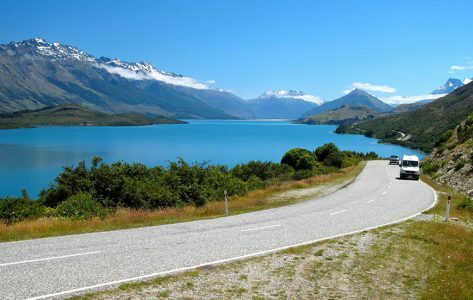 Hire a car rental in California and set off on one of the most striking journeys of your life. Northern California can get hit by big rain storms from late November, hence summers are the hot season for taking this drive, but expect the hotels and motels to be filled and whatever vacancies available to be especially pricey. – California law states that everyone in a vehicle must wear a seatbelt, and motorcyclists must wear a helmet. – Speed limits are posted in miles per hour (mph). o Generally, the speed limit on multilane freeways is 65mph/105 kilometres per hour (kph); on two-lane highways, the limit is generally 55 mph/90 kph. – It is against the law in California to write, send, or read text-based messages while driving, and drivers must use a hands-free device when speaking on a mobile phone. 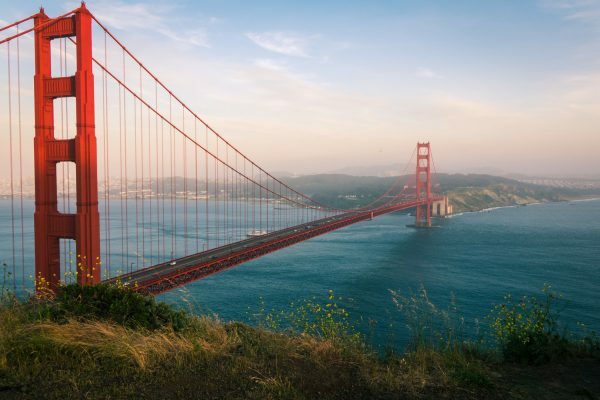 Beginning your Big Sur California adventure in one of the world’s most cosmopolitan cities, be sure to spend some time in San Francisco before you embark on this bucket list journey as you will have plenty of places to visit in San Francisco. While it’s impossible to reduce all of the amazing things to do in San Francisco down to a small paragraph, some unmissable activities include wandering over to Fisherman’s Wharf where you’ll see hundreds of sea lions at Pier 39, make your way over to San Fran’s famous winding Lombard Street to snap a few photos before venturing over to the famous Golden Gate Bridge, followed by a stroll around Golden Gate Park, the California Academy of Sciences, and a visit to the row of pastel-colour Victorian and Edwardian homes known as the Painted Ladies or you could even go shopping. At the end of your trip, you can find great hotels in San Francisco to have rest and take a breather. The classic Californian beach town of Santa Cruz should be your first stop. This ultra-mellow beach town along Highway One on Big Sur California Route is a surf town at its heart. Take a boat tour out from the wharf for excellent whale-watching—grays, blues, or humpbacks, depending on the time of year— or head inland just a bit to see the ancient trees at Big Basin Redwoods State Park, located in the Santa Cruz Mountains. The boho-funky beaches of Santa Cruz, where surfers carve waves and kids play on a classic waterfront boardwalk will surely leave you enchanted and complete your California road trip. 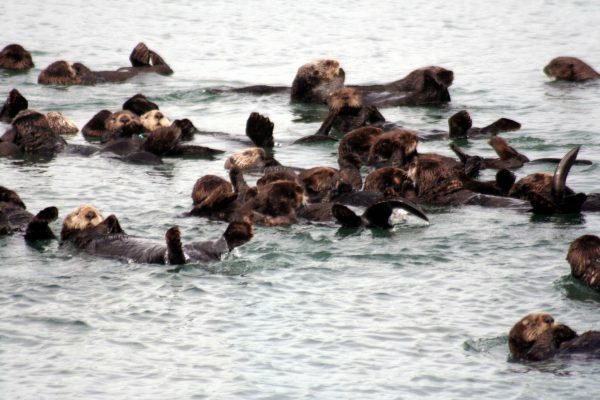 A quaint fishing village featuring several antique shops, art studios, fresh seafood markets and delightful restaurants all within strolling distance of each other, Moss Landing is a seaside gem that holds the largest population of sea otters on the Monterey Bay. With over 600 slips for recreational boaters and commercial vessels, the Moss Landing Harbor along the Big Sur California route is a lovely spot to moor. Once you are on land, explore the Elkhorn Slough Reserve, a one-of-a-kind ecosystem home to diverse wildlife. In addition to this, during summers, when conditions are calm, experienced paddlers can take guided kayak tours into the open ocean off Moss Landing, putting them smack-dab in the middle of the whale-watching action. 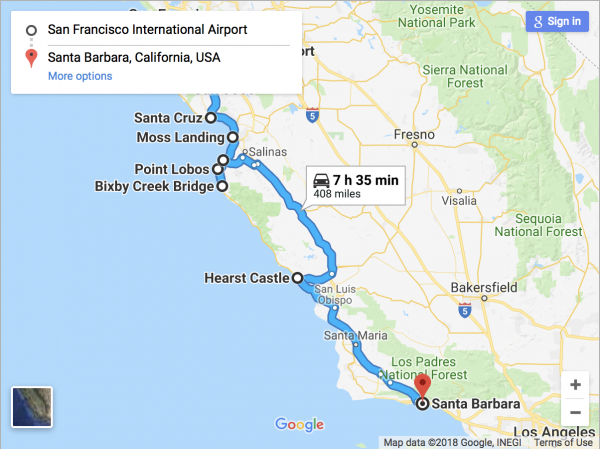 The modest seaside town of Monterey – a destination all by itself – is a two and a half hour drive from San Francisco along the Pacific Coast Highway on the Big Sur California Route. 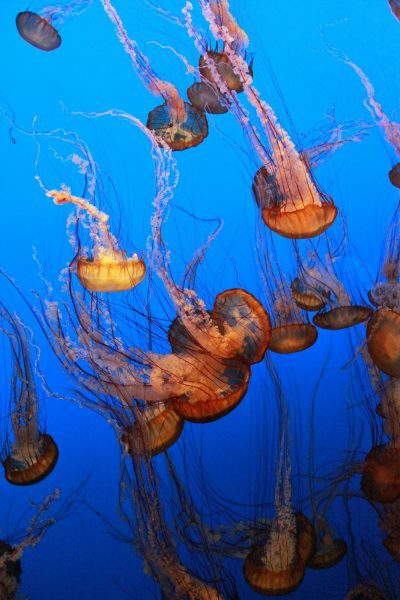 With its psychedelic jellies and bat-ray petting tanks, your first stop should be Monterey Bay to visit the world-renowned Monterey Bay Aquarium. Step outside and find yourself among hotels, shops, and restaurants filling former fish-packing plants along Cannery Row, made famous by local author John Steinbeck. For beach access, consider the Monterey State Beach (W1) where you can swim, surf, explore tide pools, beachcombing, kayak, scuba dive, and of course, enjoy a romantic stroll on the beach. The Asilomar State Beach (W2) also offers beach access, as well as coastal hiking and a boardwalk loop through a dune. Then take a walk along Fisherman’s Wharf before grabbing some on Cannery Row. Pick up the scenic ‘17 mile drive’ which is a private road from Monterey to Carmel through the gated community of Pebble Beach. The 20-minute drive passes beautiful mansions, golf courses and passing the ‘Lone Cypress’ tree on the coast. Spend an hour or two hiking around the gorgeous shoreline trails and wave-battered bluffs of Point Lobos State Natural Reserve(10 minutes south of Carmel), and don’t miss your chance for a photo of Big Sur California’s Bixby Bridge, another 20 minutes beyond the park. 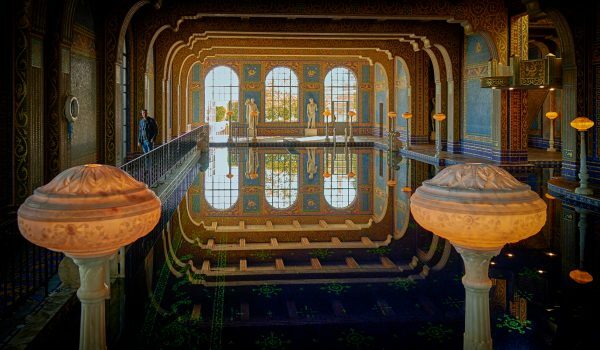 Lavishly designed by Julia Morgan (California’s first female licensed architect), as the private residence of publishing magnate William Randolph Hearst, the complex, completed in 1947, is an extraordinary temple of opulence and excess. Now showcased within one of Big Sur California’s most visited state parks, it is a must-see, an eye-popping extravaganza with a 165-room castle, 127 acres/51 hectares of terraced gardens, fountains, and pools. The estate sprawls across acres of lushly landscaped gardens, accentuated by shimmering pools and fountains, statues from ancient Greece and Moorish Spain and the ruins of what was in Hearst’s day the world’s largest private zoo. Tours usually depart starting at 9 am daily, with the last leaving the visitor centre for the 10-minute ride to the hilltop by 4 pm (later in summer). The best way to reach this estate is by hiring a car rental in California. 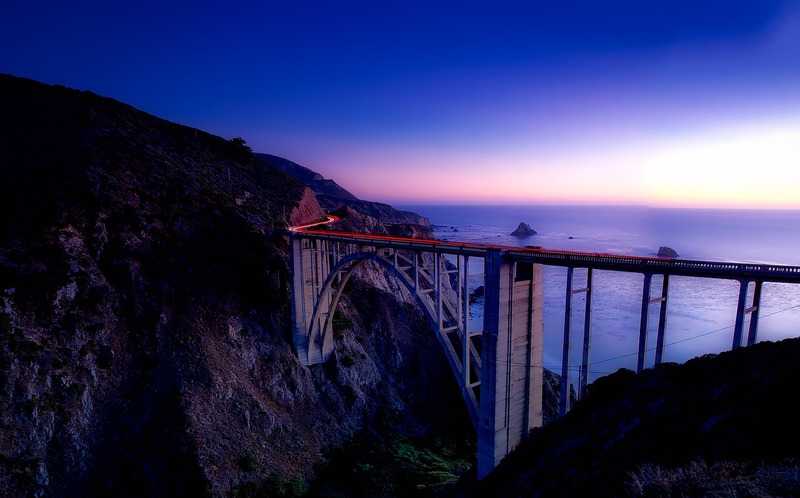 Your road trip along the Big Sur California route culminates in the perfect architecture and setting. 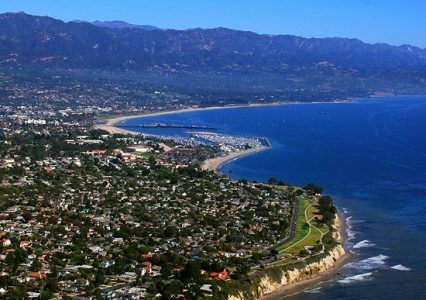 Take it from the movie stars who sneak away to Santa Barbara all the time—or just straight up move here. Oprah, Brad, Ellen, and other first-name’s-enough A-listers have estates here. And why not? There’s that legendary Old World beauty that befits the city’s nickname, “The American Riviera.” Add wine country producing award-winning vintages, outdoor adventures on land and sea, big-city arts and entertainment, and you have a city that’s a poster child for the California good life. Stroll State Streets for excellent shops and dining, launch a kayak from East Beach to paddle under Stearns Wharf, visit the classic Old Mission Santa Barbara, and tour the 1782 Presidio for a look at original adobes like El Cuartel, the second oldest surviving building in the state. To take the best out of your trip you must hire a car rental in California. 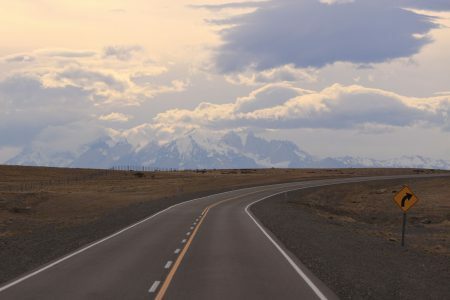 The US is a vast country and hosts multiple routes to experience a great road trip. One such great drive is the White Rim Trail. 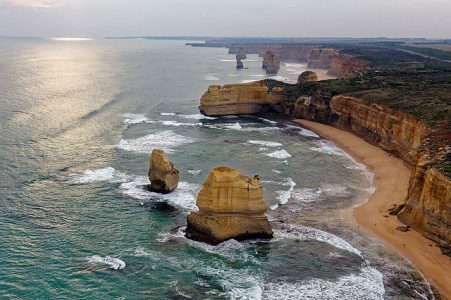 Begin your epic adventure by hiring a car rental San Francisco International Airport and setting off to explore a city packed full of character and diverse things to do and make your trip along the Big Sur California trip unforgettable. As you cruise south on the Pacific Coast Highway, getting afar from the city buzz in your rearview mirror, breath-taking sights unfold before you. 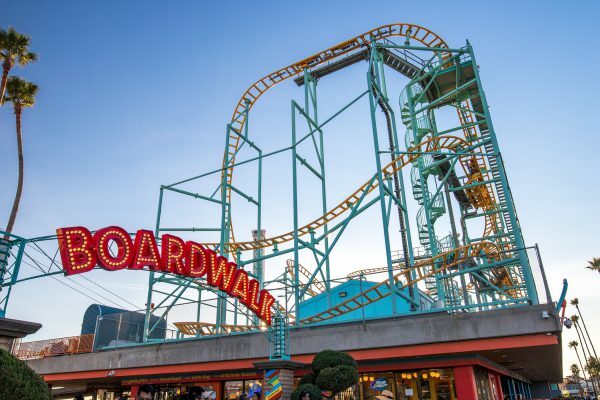 Your first stop will be Santa Cruz – stretch your legs along this half-mile long beachfront amusement park before heading to the next destination. Admire marine life at its best at Monterey Bay Aquarium and engage in water activities like whale watching and surfing. And after a dose of the magnificent marine ecosystem, why not sip some wine. Just a reminder, don’t hesitate to pull over and take in the gorgeous Pacific vistas from time to time. Immerse in the Spanish heritage, visit the city’s historical sites – Mission Santa Barbara, Stearns Wharf and the Moreton Bay Fig Tree, go sea kayaking through caves in the Channel Islands, grab lunch at one of the 450 restaurants and café ranging from California-centric interpretations of Mediterranean flavours to spicy regional Mexican cuisine. Take the U.S. Highway 101 South for 40 miles, and in 2 hours you will rub shoulders with celebrities along Hollywood Boulevard – Los Angeles. 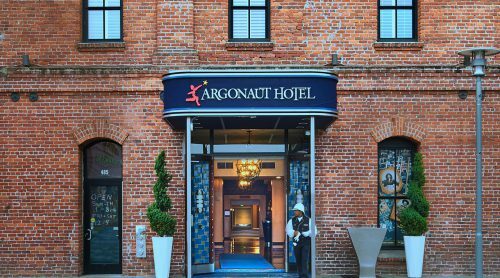 With a name like the Argonaut, it’s impossible not to speak of this hotel is grand, almost legendary terms. Located in Fisherman’s Wharf San Francisco and inspired by the Greek legend and Gold Rush-era adventurers, it’s one of those rare places to visit in San Francisco that truly merits a term like iconic. 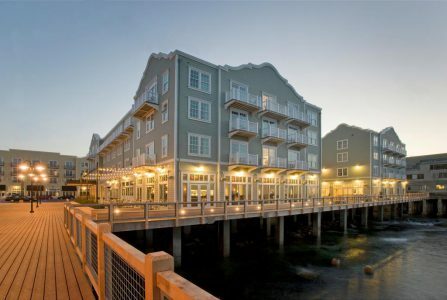 Located in the historic Haslett Warehouse in Fisherman’s Wharf, the Argonaut hotel is a grand building built in 1907 of exposed brick, Douglas Fir beams and much seaside character; you feel as though you can almost reach out and touch the colourful Barbary Coast past here. Enjoy panoramic ocean views and radiant sunrises on beautiful Monterey Bay at InterContinental The Clement Monterey. Overlooking the sapphire waters of Monterey Bay on Cannery Row, our waterfront hotel, resort and spa is where beauty and luxury indulge your senses. Whether you are planning a family vacation, romantic getaway, or special event, The Clement Monterey is an inspiring Monterey Bay hotel with urban energy, modern luxury, and coastal charm. Escape to the California Coast and feel the spirit of Monterey. 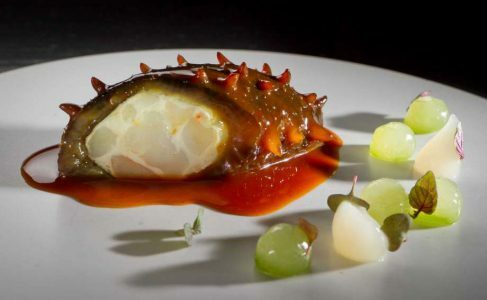 The highlight of the hotel is its award-winning restaurant Aubergine. 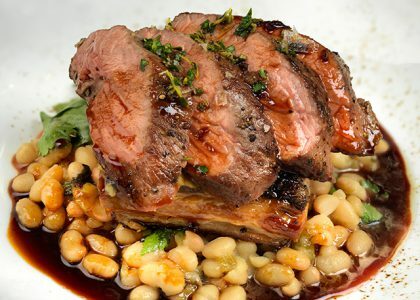 Executive Chef Justin Cogley, a Grand Chef Relais & Châteaux Grand Chef, and Executive Pastry Chef Yulanda Santos prepare skilful, ingredient-driven cuisine that celebrates the bounty of the region. 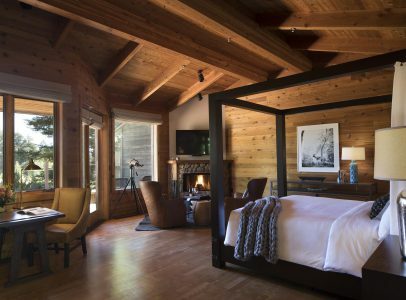 An exclusive 5-star resort set amid 160 forested acres on the rugged Pacific coast, Ventana (Spanish for “window”) is both inspired by and reflective of its majestic setting in Big Sur. 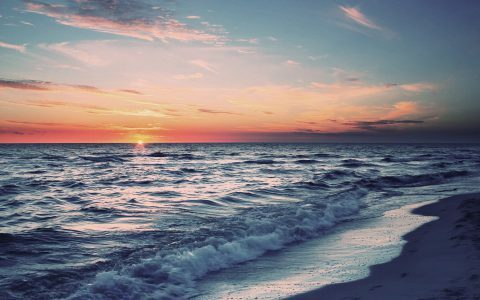 Watch the sunset over the ocean. Explore rolling hills and old-growth forests. Reconnect with your body and spirit. With a thoughtful combination of private sanctuaries and interactive, social spaces, this is a place for all — whether you’re looking for romance and connection, or more interested in solitary reflection. Featuring Spanish Colonial Revival architecture and modern Moorish themed interior décor from celebrity designer Martyn Lawrence Bullard, the Hotel Californian is the new centre of the Santa Barbara waterfront. 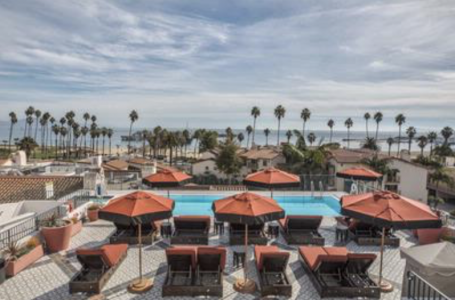 Incorporating the façade of the original 1925 Hotel Californian, this 121 room seaside destination features a rooftop pool and event deck providing panoramic views of the coastline and the Santa Ynez Mountains. Located steps from the beach, one block from Santa Barbara Amtrak Station and adjacent to Santa Barbara’s vibrant Funk Zone, the Hotel Californian includes a luxurious Turkish-inspired spa, fashion boutique and fresh and distinctive dining options. For every item on our menu, Executive Chef, Charles Phan goes to the original source region of that item. 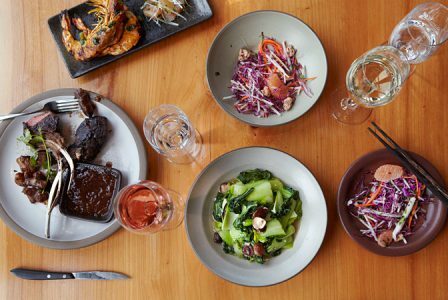 He studies the traditional ingredients, flavours and techniques, then retreats to his Mission district test kitchen, where he and his team recreate the original using contemporary methods and the finest and freshest local ingredients. The finished product is a faithful reproduction of a world classic, modernized in subtle yet powerful ways. 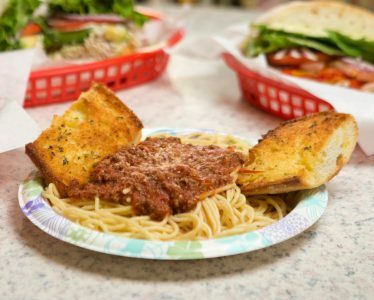 The Meatball Italiano or their raviolis are guaranteed to make you feel like you’ve been transported back in time to a little old Italian village where you can practically smell the marinara simmering on the stove. Not only do we they vegetarian choices for sandwiches – just think of all those fresh veggies and marinated treats and roasted eggplant that they make fresh – but the soups and raviolis are also great for the non-meat-eating crowd. The Tiramisu is beyond amazing as well as the selection of other homemade desserts (think blondies!). But the Deviled Eggs are fantastically special. In addition, their patio offers some of the best people watching available in town. Housed in the historic city’s first firehouse built in 1910, they opened our doors in 1995. Through the years we’ve gone on to win numerous national and regional awards for excellence (from the likes of Wine Spectator, Esquire, Wine Enthusiast and the American Culinary Federation). Most notably Montrio has been voted “Best Restaurant in Monterey County” for 10 years and designated a Sustainable Seafood Watch Ambassador. Located at the end of Stearns Wharf, the SB Shellfish Co. has been serving up live local crab & lobster for over 20 years! 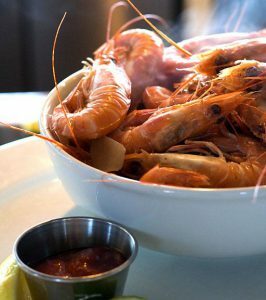 Shellfish Co. is known for its delicious chowder, signature cioppino, lobster tacos & abalone. Chow down on garlic-baked clams, crab cakes and coconut-fried shrimp at wooden picnic tables outside. They offer a tasting menu that features a wide variety of seafood and vegetables, a few meat courses, and some sweets. Please plan three hours for your dinner. With advance notice, they will adjust the menu to accommodate certain dietary restrictions. The wine list contains 300 selections with an emphasis on France, California, Germany and Austria. They also offer a variety of wines and sake by the glass, select beers, and a beverage pairing to accompany the menu. Corkage is $80 per bottle.